When Rich Rodriguez arrived at Michigan, he saw a flood of players leave the program because they no longer thought they fit his system. With the arrival of Brady Hoke--and, oddly, seemingly no attrition at all--comes the death of Rodriguez's schemes and the rebirth of the pro-style offense, as well as the similarly drastic scheme changes. And while Michigan doesn't have any players that are downright refusing to play in the new system, there are a number of players who should be significantly affected by the new offensive and defensive styles. While most of my thoughts on the following players will largely be speculation, Campbell has already felt the sands of change. After coming out of high school as a 5-star defensive tackle recruit, Campbell has puttered around on the bench before being moved to offensive guard late this year. 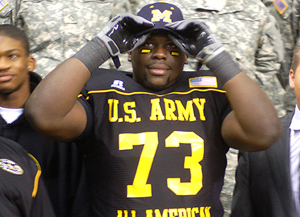 But when your new head coach is a former defensive line coach, and you have a should-be-star defensive tackle in the mold of Gabe Watson--who Hoke coached during his freshman year at Michigan--sitting the bench (on offense, no less), you're bound to see some changes. Prediction: Not too much to speculate about here. Hoke has already announced Campbell's move back to the defensive side of the ball, which bolsters a fairly thin defensive tackle depth chart. Campbell's move also likely signifies a shift back to the 4-3 defense that Michigan ran under Carr. I was relatively excited about Campbell coming into last year. After watching him at the Spring Game, he looked like he had finally come into his own as a nose tackle. But Greg Robinson and company saw something different and Campbell rode the bench most of the year. My guess is that Campbell becomes a significant contributor sometime during the season next year, if not immediately. One of the big changes from the Rodriguez to Hoke regimes will be a migration away from tiny slot receivers that Michigan has stockpiled in the last three years. Since Rodriguez took over, it seems like Michigan has offered every slot receiver that gets described as "explosive" and "shifty". Pro-style offenses, however, only have so many uses for tiny slotbacks. And with Michigan's logjam currently being fronted by Roy Roundtree and Martavious Odoms, I suspect that a few of these guys are asked to move to the other side of the ball to try and bolster a young secondary--or risk sitting the bench for the entire season. Specifically, journeyman Kelvin Grady, Terrance Robinson, and "return specialist" Drew Dileo seem like the most likely candidates for the move if only because of the placement on the team's depth chart (with touted freshman Jeremy Gallon lurking around the depth chart, Michigan doesn't have to worry about depth going forward). Prediction: At least one of the three players mentioned above moves to the defensive side of the ball. The most likely seem like Dileo, who was brought on primarily to return kicks, and Terrence Robinson who has seen the bare minimum of playing time. The chances any one of these players actually contributes to the defense are slim, but their presence will bolster the defensive back core and give Hoke more options should he need them. If any of the position switches prove to be contributors, Michigan may even be able to redshirt one or two of the incoming defensive back recruits, building experience and depth for the future. For the last three years, Kevin Koger and Martell Webb have spent their time clubbing unexpected linebackers and blocking for tiny quarterbacks. And for the most part, Rodriguez's offense had little or no use for tight ends, using them sparingly as H-backs and rarely slipping them out of the backfield as receivers. 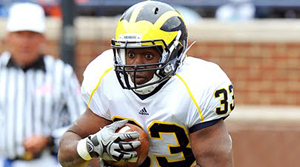 But Hoke's pro-style offense will utilize Michigan's talented tight end frequently. While much of it will be spent on the offensive line blocking for whoever is under center, we're also likely to see a lot of pass plays where the tight ends head upfield as receivers. Prediction: Koger will see a significant increase from the number of snaps they saw this year. Not only that, but his receiving numbers will improve significantly. Last year, Koger netted 14 catches for 199 yards, and 2 TDs. I fully expect those numbers to at least double next year (should the offense not implode). The concern for Michigan's tight ends is that there's not enough of them. Michigan will need to recruit tight ends heavily and get a few more on campus should they have any stability at the position (not to mention that Koger will be a senior). If you're saying to yourself, "Who the hell is John McColgan? ", you're probably not alone. McColgan is the sole full back currently on the Michigan roster, and with Michigan's return to a pro-style system, McColgan is sure to see a serious bump in playing time. He saw basically zero time this year, but was the recipient of one pass: a touchdown strike by Tate Forcier early in the year. Otherwise, McColgan was mostly a nonentity. Prediction: Like Koger, McColgan's skillset and position is more frequently utilized in Hoke's pro-style offense than Rodriguez's, and should see a significant boost in playing time. 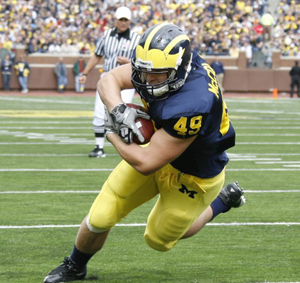 But like Michigan fullbacks before him (see: Mark Moundros), McColgan was a walk-on and may not be the kind of player that is built for more frequent playing time. Regardless, unless Michigan finds another option at fullback in this recruiting class, you can be sure that McColgan will see a serious bump in playing time. Hopkins was able to find playing time as a true freshman amidst a crowded running back depth chart. His skillset isn't even geared toward the Rodriguez system, but his skills and size were too tempting to keep on the sideline. With that in mind, Hopkins may very likely take over the starting RB position at the beginning of the 2011 season. Hopkins would see more playing time regardless of who the coach was next year, but given how well his skillset matches Hoke's offensive style, it's safe to say that Hopkins will be on the field a lot more than he was in 2010. Prediction: With Vincent Smith too small to consistently run between the tackles and Mike Shaw's frequent injuries, don't be surprised to see Hopkins take the first handoff next year. If he can cure his case of fumble-itis and improve in both the weight room and add a bit of speed, Hopkins could be the kind of every-down back Michigan hasn't had since Brandon Minor (minus all of the injuries *knock on wood*). Most likely, Hopkins will split time next year between Shaw and Mike Cox (who will also see more playing time). It's safe to say that neither of these two are going to be switching positions this year, but who takes the reigns as the starting QB is something of a question mark (at least in my mind). Denard is the one with the experience and record-setting season on his resume, but he lacks the prototypical pro-QB size and accuracy that may be demanded of him in Hoke's system. Gardner has the size and certainly more touch on his deep throws than Denard, but he also had an awful tendency to throw wobbling ducks and do general freshman-y things. Gardner has had a full season to correct his throwing motion, and if his talents come to fruition during spring camp, there's a chance he could be the starter come fall. Prediction: This probably isn't as much of a debate as I think it is, but I can't help but think that Gardner has a shot at starting next year. In the end, I'd bet that Denard is your starter next year, but Gardner is close on his heels (and looks competent either in clean-up duty or when Denard inevitably gets injured). However, if Gardner's throwing motion is much improved--and it's likely it could be--there's a very real possibility that his size and arm strength are more important to Hoke's offense than Denard's running ability. That said, Denard is almost certainly The Guy next year. Good analysis. A couple of quibbles below. I don't see the benefit of moving WRs to DB just for the sake of depth. DB is already a deep position group, with 8 sophomores on the current roster (not counting Furman or C.Gordon) not to mention the upperclassmen. Depth isn't the issue in the secondary - incoming freshman can redshirt all they want. The issue at DB is proven talent, with only Woolfolk having shown to be a Big10 caliber player. Kovacs and Avery have shown promise, though, and Robinson/Johnson/Christian have the recruiting profile that indicate high upside. Its hard to envision how Dileo helps when you also have people like Talbott, T.Gordon, and incoming freshman floating around. 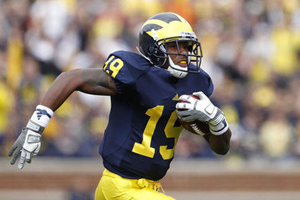 WR, too, is deep in 2011 but after this year, the proven talent at WR consists of one guy: Roy Roundtree. There should be plenty of use of 3 and 4 WR sets where slots can still be utilized. "Rodriguez's offense had little or no use for tight ends, using them sparingly as H-backs and rarely slipping them out of the backfield as receivers." This is just wrong. Koger or Webb were in on most plays last season. They didn't catch a ton of passes, but were usually used as blockers... Would you also say Rodriguez's offense had no use for offensive lineman? TE's mostly block in both a pro-style and a spread. If the presumed move to 4-3 defense goes down, the biggest change is that a safety type may be pushed out in favor of a bigger DT like Ash/Washington/Campbell. That may mean more bench for Vinopal/Kovacs/T.Gordon/Johnson or even C.Gordon if he struggles as a pure OLB. If we indeed see more 2 WR sets, as you predict, theres going to be an enormous loss in role for either Hemingway, Stonum, Odoms, or Roundtree. I'd guess some slots see the writing on the wall and transfer if they're unwilling to wait till 2012. My prediction: We still see plenty of 3/4 WR sets. We simply don't have the depth at FB/TE to put 2 of them on the field for most plays. The slot receivers would move specifically to CB, not the safety positions you mention here. The CB position is still pretty thin. Woolfolk will likely return at FS, and Cullen Christian may move there as well leaving Floyd, Avery, and Talbott as the only CBs with any playing time. Michigan has three CBs currently committed, but redshirting some of them would be beneficial. There's still a need for more depth at CB. The tight ends really weren't on the field as much as you thought. On passing downs, Michigan rarely had a TE on the field, and running downs often had two RBs in the backfield with three WRs. Sure there were uses for the TEs, but they were a long way from being on the field for "most plays", as you mention. The safety positions will be weird because of the scheme change but I hesitate to mention too many of them without knowing exactly what system Michigan will be playing on defense. Kovacs et al likely won't see the field as much, you're right about that. My guess for the offense is a lot of I-formation (or single back formations) from under center with two or three receivers, with an emphasis on the latter. Your starting receivers will be Hemingway and Stonum with Odoms and Roundtree splitting time in the slot and both coming in on passing downs. The CB position is thin and the safety position is deep, so lets move our best CB to Safety? Because of the bodies at safety, its unlikely Woolfolk and Christian are both moved away from CB. I'd bet neither guy moves. Theres no reason to move people from safety when it means more playing time for JT Floyd. This team can't afford to move Woolfolk. The gap between him and Floyd or Talbott/Christian is bigger than the gap between him at FS and Vinopal/Robinson. We may not have a prototypical FS, but the Michigan of old favored bigger Safeties who could lay a hit and support against the run anyway. Robinson and Johnson could be favorites to form a starting safety duo. Vinopal and Kovacs have experience. T.Gordon and Hawthorne provide depth. Would you be shocked to see Cam Gordon back at DB (SS? ), especially if Evans and Rogers rejoin the team? So that's 5 guys probably at CB, which isn't a lot, but with at least 3 incoming recruits (all with more experience playing CB than Dileo, Grady, Robinson have) theres no real benefit to having a 6th or 7th CB. If an injury happens, one or two of the freshman will burn a red-shirt, but that's still better than playing a slot at CB. I agree with you about the 3 WR sets. Its hard to imagine pulling Odoms or Roundtree off the field for McColgan. I think you're underestimating the importance of a good free safety and overestimating how good it is to have a FS in the mold of Michigan's past. Returning Woolfolk to his natural FS position could be a huge boost for a defense whose safeties have been helpless the past three years. And in terms of WRs: I expect 3 WR sets, but I also expect Roundtree to eat some pine next year unless he can get his case of the dropsies in order. When Michigan goes to two-WR looks, Hemingway and Stonum will probably be the guys on the field (maybe Odoms). I think a lot of Roundtree's success has been the function of the system. He showed throughout the year that he's not an elite receiver and can't be counted on from down to down. And unlike Braylon who had a similar dropped ball problem, Roundtree doesn't have the deep threat capabilities of Braylon. All conjecture this early in the process, but what else have we got to talk about, right? I think you're wrong about what Woolfolk's "natural" position is. He was moved to FS out of necessity. I think its more likely Floyd gets moved to FS, personally... I just can't see Hoke and Mattison putting promising and talented players like Johnson, Robinson and Gordon on the bench and letting Floyd play instead. These guys love big physical players who can hit. I've been extremely down on Christian and thought he was headed for a move to FS, but I suspect he fits the size prototype that they want at CB. I'm not sure he'll move but I'm also not sure he has the skills to stay at CB. I'll believe Rogers is on the team when I see his name on the official roster. Like RR, I think Hoke/Mattison are going to attempt to establish an identity immediately. Their focus will be on defense and being tough and hard-hitting. That approach may shove Vinopal and Kovacs and maybe some of the smaller CBs to the bench. Also, while its rare, I wouldn't be shocked to see one of last years true freshman end up taking a redshirt. Someone with talent, like Christian, could move to another position and soak up a year of experience before seeing the field in 2012. I completely agree with you on Roundtree's success being scheme-derived, but don't tell that to all the people who want him to get the #1 jersey. He's a great kid, very good route runner, and usually a reliable target. He has 2 more years to show consistency, but he doesn't have the size or speed to be an NFL player. ...Agreed, its certainly a time for conjecture.